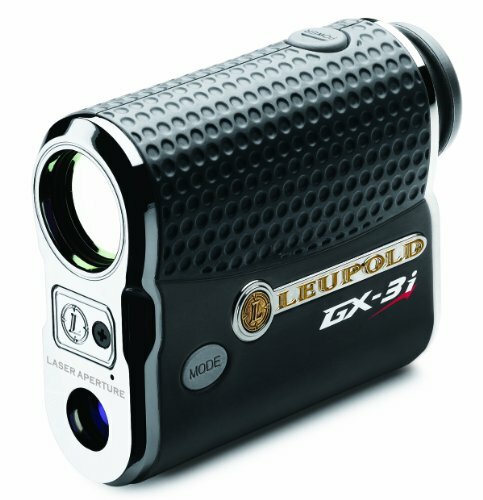 Leupold GX-3i Rangefinder Leupold’s GX Series of Digital Rangefinders are feature-rich and precision engineered to provide reliable distance readings on the course so you can take the guesswork out of your club selections and swing. The GX-3i offers all the fundamental Leupold rangefinding technology but with the added benefit of a bright red, easily viewable OLED display and added rangefinding distance. Pinhunter technology is Leupold’s proprietary laser beam geometry that separates returned background readings from target readings to ensure you are getting the right reading to the right target. Scan mode allows you to hold down the power button to gather multiple readings in one quick sweep. As an added benefit on courses with prism technology, the GX-3i will beep and freeze the display the moment you scan a prism-topped flagstick, assuring you of an accurate pin reading. The optical system combines precision glass with a cutting-edge coating technology and rugged structural components. Looking through the viewfinder, you will see seven selectable aiming reticules and distance readings in either yards or meters. The GX-3i’s maximum range is 800 yards, or 731 meters with an accurate pin range of 400 yards. The batter supports thousands of actuations and the built-in indicator will let you know when the battery life is low. The whole unit is only 6.8 ounces and is durable enough to hold up to just about any weather condition you’ll run into on the course. The red OLED display is still the best of any rangefinder. It is bright and easy to see. The contrast on either a bright sunny day or a cloudy grey day is superb. If you want a laser rangefinder, the discussion starts and stops with Leupold. Quality, accuracy, durability, ease of use…their lasers simply have everything that you could want.